Formaldehyde is a colorless, flammable gas with a strong odor. A small amount of formaldehyde is produced in our bodies naturally, but most formaldehyde is released into the environment by the burning of fuels and household waste. Cigarette smoke and e-cigarette vapor both contain formaldehyde. Most of us think of formaldehyde as a liquid, but in reality, the substance that is used to preserve biological specimens is called formalin, a mixture of formaldehyde gas, water, and methyl alcohol. Formaldehyde is also an industrial chemical that is present in a wide variety of applications. It's used to produce building materials (including pressed wood products) and many household products and is even a part of the manufacturing process for wrinkle-free cloth. Formaldehyde is also used in glues, adhesives and disinfectant products. Surprisingly, formaldehyde is also used to deactivate live viruses and toxins that are used in making vaccines. This process is regulated by the U.S. Food and Drug Administration. The most common way people are exposed to formaldehyde is by breathing air that is tainted with it in poorly ventilated indoor environments. Products made with formaldehyde can release this gas over time, causing the concentration to build up in enclosed areas. Another common source of exposure comes from cigarette smoke, which is laden with formaldehyde. Research suggests that e-cigarette vapor also contains formaldehyde, though in quantities that are usually less than what is present in cigarette smoke. Breathing secondhand and thirdhand smoke indoors is a contributing factor for formaldehyde exposure as well. Formaldehyde is a by-product of the combustion process of cigarette smoking. 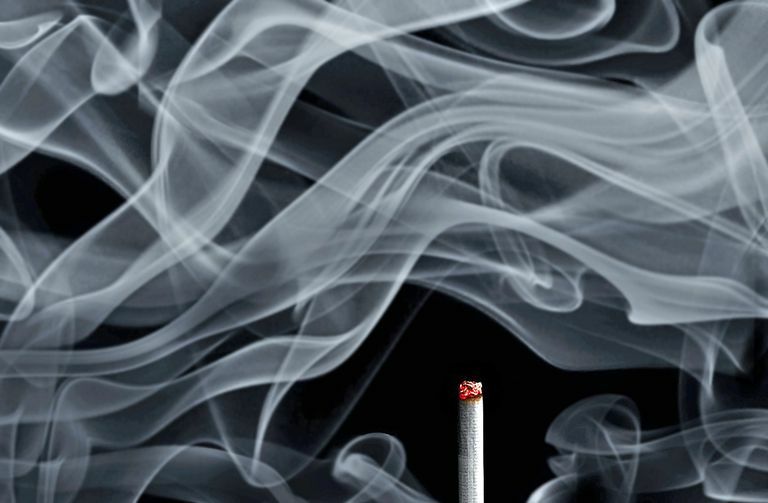 According to an article in the American Journal of Public Health, formaldehyde in sidestream smoke (the smoke wafting from the end of a lit cigarette) is present in concentrations of up to three times occupational limits. A person who smokes 20 cigarettes a day can have a level of formaldehyde in their blood that measures between .9 and 2 milligrams depending on the brand of cigarette and how well ventilated the area they're smoking in is. Formaldehyde is responsible for some of the nose, throat and eye irritation smokers experience when breathing in cigarette smoke. In a letter published in the January 22, 2015 issue New England Journal of Medicine, researchers suggest that a "masked" form of formaldehyde is present in the condensed liquid from e-cigarette vapor in concentrations much higher than in cigarette smoke. The scientists call it masked because it is a slightly different form of formaldehyde—one that they feel is more likely to be deposited on delicate lung tissue, once inhaled. Formaldehyde levels in the blood tend to be less than they are with cigarettes. The average measured is approximately 1mg, but this is dependent in part on the heat setting of the electronic cigarette device being use to administer the e-cigarette vapor and the amount inhaled. Some people are quite sensitive to formaldehyde, while others have no reaction to the same level of exposure. People who are sensitive to formaldehyde run the risk of developing asthma from continued exposure to inhaled formaldehyde. Lab studies have shown that exposure to formaldehyde could cause nasal cancer in rats, and some studies of industrial workers have suggested that formaldehyde exposure might be associated with nasal cancer and nasopharyngeal cancer in humans. In 1995, the International Agency for Research on Cancer (IARC) concluded that formaldehyde was a probable human carcinogen. However, in a reevaluation of existing data in June 2004, the IARC reclassified formaldehyde as a known human carcinogen. Because it rapidly changes in chemical composition once it's absorbed, scientists think inhaled formaldehyde is primarily an upper respiratory tract cancer risk. More research is needed to understand what happens when it reaches the lungs. Researchers also believe that formaldehyde is a significant risk factor for myeloid leukemia. To date, science has identified more than 7,000 chemicals, including 250 poisonous and 70 carcinogenic compounds in commercially produced cigarette smoke. If you're still smoking, start working on a plan to quit. Smoking offers nothing but disease and ultimately, death. American Chemistry Council. Why is Formaldehyde Use to Make Vaccines? International Agency for Research on Cancer. IARC Classifies Formaldehyde as Carcinogenic to Humans. June 15, 2004. National Cancer Institute. Formaldehyde and Cancer Risk. New England Journal of Medicine. Hidden Formaldehyde in E-Cigarette Aerosols. N Engl J Med 2015; 372:392-394. January 22, 2015. Regulatory Toxicology and Pharmacology. Effect of variable power levels on the yield of total aerosol mass and formation of aldehydes in e-cigarette aerosols. March, 2016.